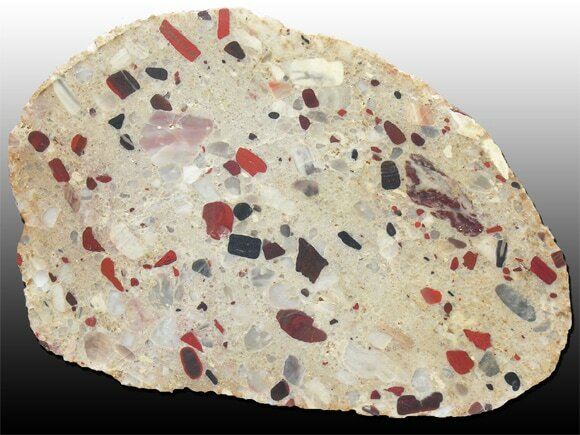 Jasper Conglomerate, locally known as "Puddingstone" finds its beginnings in the Huronian Period of the Proterozoic Era, an estimated billion years ago. During this time great amounts of sediment that came from erosion from older rocks were deposited in large bodies of water. The different hues of red jasper pebbles were deposited in small parts over an east west band about fifty miles in size that lays mainly in Ontario, but touches a small area of the Upper Peninsula. Sandstone under the weight of later sediments formed the grains becoming sand conglomerates. Erosion and weathering uncovered loose fragments and great masses were moved by the Labrador portion of the continental sheets. The Puddingstone got its name from the British settlers that were stationed at area Forts like that found on Drummond. It is so named because the English believed it looked like boiled suet pudding with berries. The one you see above is an example of a Jasper Conglomerate. 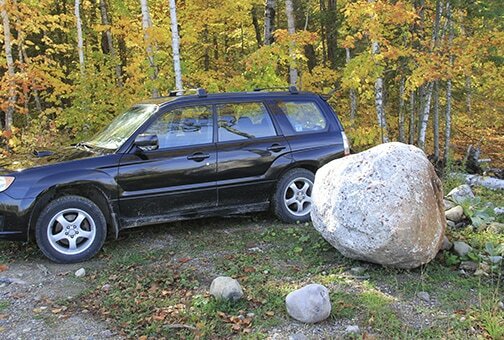 Puddingstones can be found as small as a pebble and larger than a dump truck! They can be found along the shores of Drummond in our forests and anywhere earth has been turned. Drummond is known as the Gem of the Huron and at the center of her crown is the Puddingstone. Puddingstones are regularly found in many of our local shops in the form of jewelry, bookends, coasters, and more. Puddingstones come in all shapes, sizes and colors. They can be as small as a pebble and larger than a dump truck!